This entry was posted on July 25, 2015 by joeleagle. It was filed under Insects, Nature, plants and was tagged with Blue Dasher (Male), Blue Dasher dragonfly, Manjith Kainickara, Rose Bush. Wonderful shot, Joel, of one of my favorite friends of the summer. 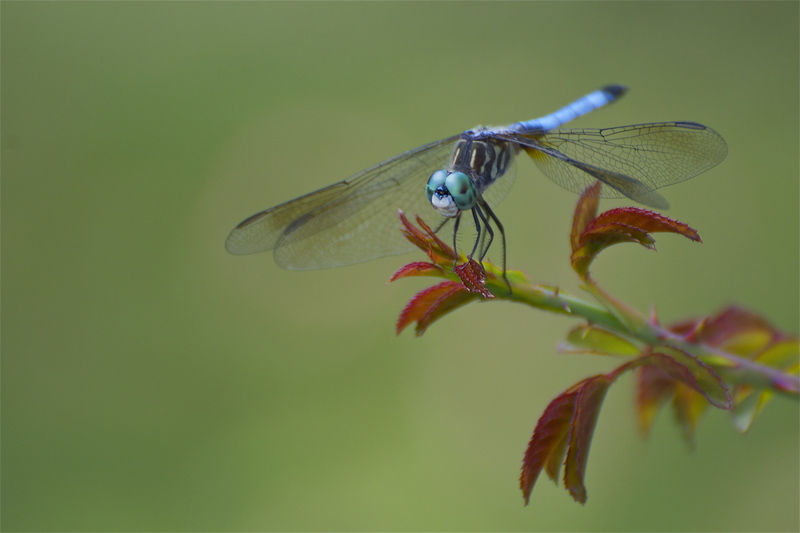 Normally my background for a Blue Dasher is the muddy water of a marsh, so it’s nice to a more pleasing set of beautiful colors. Thanks Mike! I made my first trip to Ladew Gardens yesterday, definitely worth the ride. Lots of dragonflies! Haven’t been there, though today for the first time I made a trip with some friends to Lilypons and think I got some decent dragonfly shots (I haven’t reviewed them yet). Did you enjoy Lilypons Mike? I definitely did. The lotuses were well past their prime, but I had a great time walking through the fields among the ponds on the interlocking paths. I could have spent all day there, but my friends had enough after about 90 minutes or so of shooting. Omgosh Joel….this is Amazing!!! Wow…just simply Wow!!! !